I have a couple more cards that came out of my session with the Darkroom Door Wildflowers vol 2 stamps recently. 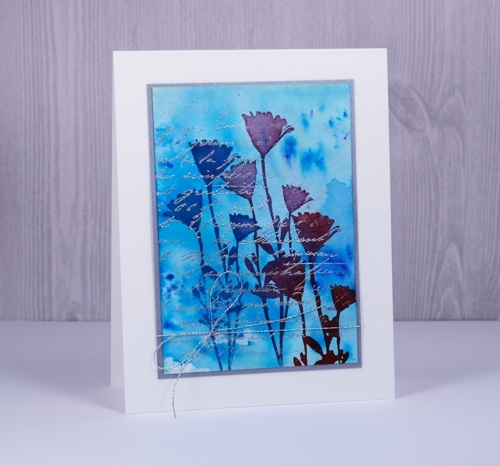 I began by making blue watercolour backgrounds with brusho paints on hot pressed watercolour paper. Rather than apply the paint directly to the paper, I sprinkled it on a craft sheet, spritzed, then pressed the paper into the paint. I was able to pick up paint that was almost in crystal form as well as soft blended sections. 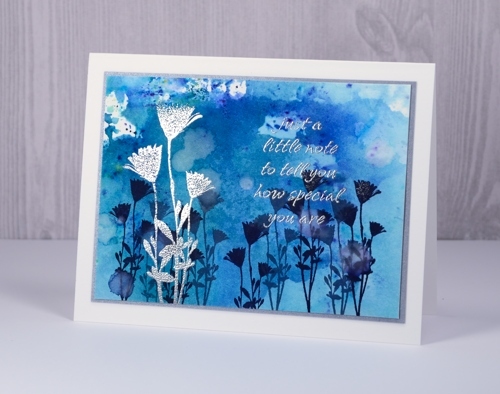 In the Wildflowers vol 2 set there is a large and a small version of the same flower so I used the small stamp on the panel above to create a base of flowers in chipped sapphire and stormy sky distress inks. I shook water droplets onto the panel to create pale watermarks here and there. 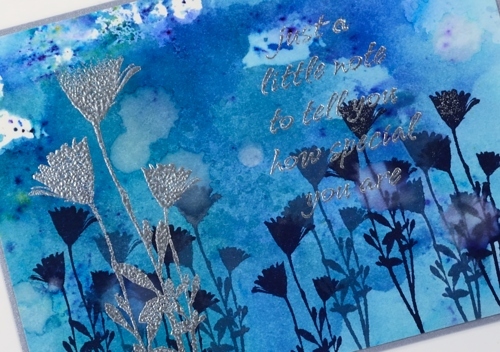 Once the panel was dry I wiped an anti-static powder pillow across it and embossed the flowers and a sentiment from Bright Blossoms vol 1 in silver over the top of the blue. The silver catches the light depending on the angle but is tricky to capture with the camera. 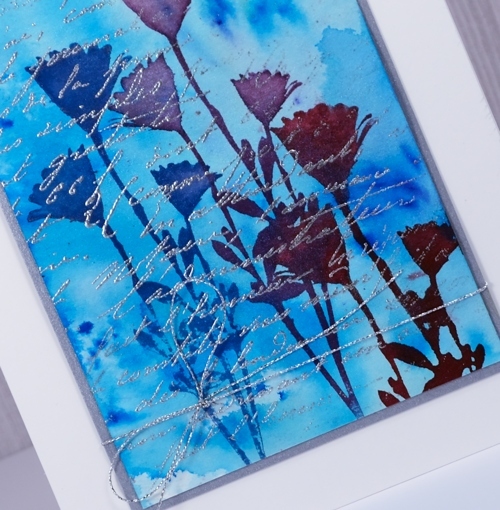 On my second card I created the painted background the same way then stamped the flower three times in different distress stains. Once again I embossed over the top with silver, this time using a partial stamping of the French Script background stamp. I framed both panels in silver cardstock and added silver thread around the second panel before attaching to white card bases. Oh, so pretty! I love them both! Love these…particularly like the subtle silver script on the vertical card! Very beautiful! So pretty! Thank you for the tuturoial!